Jimmy Jangles presents: The Optimus Prime Experiment: What does U2 really know about war? What does U2 really know about war? U2 seem to write songs with lyrics about war in some form or another on just about every album they've released. Except for Boy, that album was just full of stories....ahem. U2's lyrical references to war heated up with the release of U2 first truly 'popular' album War. Marking Bono's ascent into a true lyrical monster, War's songs features thoughts on soldiers shooting protesting civilians in Sunday Bloody Sunday. 'Seconds' reflects on terrorist actions in trying to set off atomic bombs (a theme U2 often turn to) in an supposed attempt to to cause nuclear war. Maybe they just want us all to give peace a chance. A song probably taken from the No Line on the Horizon album recording sessions, Winter was used in the soundtrack for the Wim Wenders film. Brothers (U2 have a long association with Wim - he directed their video for Stay and Until the End of the World was used for the film of the same name). 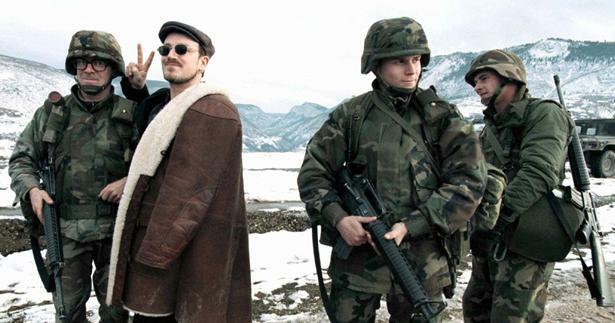 Winter is about is a song about the experience of the armed forces in Afghanistan, where Winder's film is set. Inspired by paintings that were about the nuclear bombs that were dropped on the two Japanese cities, Hiroshima and Nagasaki to effectively end Japan's involvement in World War II, the Unforgettable Fire is a reflection not on war but the last effect the atomic bombs had on the people of Japan. Arguably the most political song U2 has ever written, at least it's probably the most popular one! The lyrics are a savage indictment on American foreign policy. Miss Sarejevo from Original Soundtracks Vol 1. When Bono asks if there's a time for East 17 (a boy band that everyone has now forgotten) during the Bonsnian war, you've gotta ask what he's talking about. The song's lyrics actually praises the rebellious spirit of the Sarajevan people who refused to surrender their way of life during the conflict. And what did they do? They staged a beauty contest. Which clearly inspired the chorus of the song, "Here she comes, heads turn around, here she comes, to take her crown". If you could consider that the IRA's disgraceful and disgusting campaign against the people of Ireland was a civil war of sorts then Please is U2 exhorting Ireland's Political leaders to stop the civil war they have been waging. Is a lyrical expression of the suffering experienced by the mothers and grandmothers of the thousands of children abducted during the conflict in Central America during the late 1970s through to the mid 1980s, particularly during Argentina's so called "Dirty War" (1976-1983). The Dirty war was a civil-style war that the American government covertly sanctioned in a bid to stop the 'communist threat' that was pervading at the time. Given this song was written in the mid 80s one can see how it's a cousin of sorts to Bullet the Blue Sky - indeed both songs appeared on the Joshua Tree album.